My last sample for the One Day Craft Crop to Aid Refugees, coming up on May 27th, is a masculine design that would be perfect for Father's Day or Birthdays. 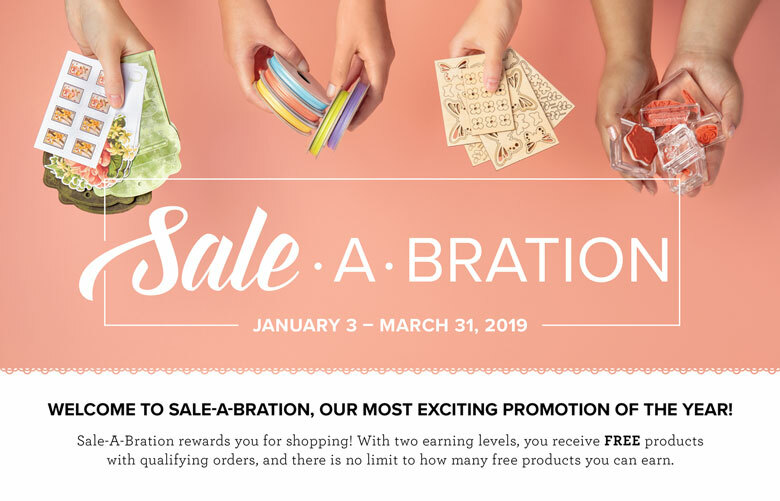 It uses several new products from the 2017-18 Annual Catalogue, including a stamp set I've been dying to use called Crafting Forever*! The name of the set comes from the sentiment, "Crafting Forever; Housework Whenever! ", which I know is my motto! 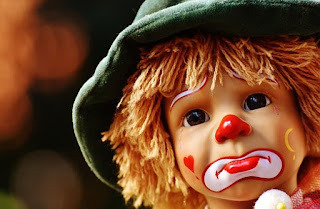 Believe it or not, I found an image in there that I've adapted to use on a masculine card. The image of the three pens from Crafting Forever stamp set* includes two pens that have sort of flowery designs on them, so to make them look more masculine, I wanted to give them a wood tone finish. To do that I needed to paper piece. I stamped the image using Basic Black Archival Ink on a piece of Gold Foil Sheet. (Give it lots of time to dry or help it out with the Heat Tool or you will have smudges!) I stamped the image again on a piece of Wood Textures Designer Series Paper from the Wood Textures DSP Stack*. From the wood grain paper I fussy cut the pieces you see here, but I had to turn them to the opposite side to get rid of the flowery images. Luckily, they were pretty much symmetrical, so it worked. I glued these pieces on the same stamped areas on the Gold Foil Sheet. 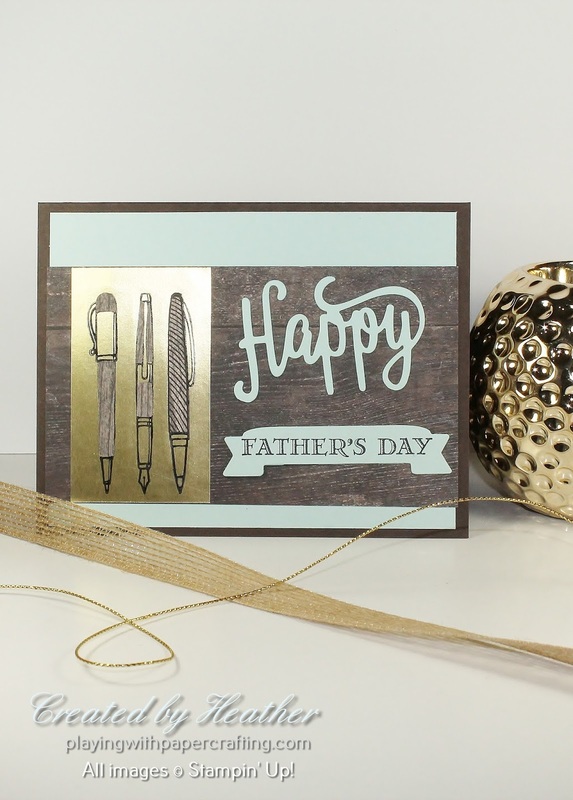 The colours of Early Espresso, Soft Sky and Gold, with the Wood tones, is a very masculine-looking combination that you can keep in mind when you want to create a card for a man. 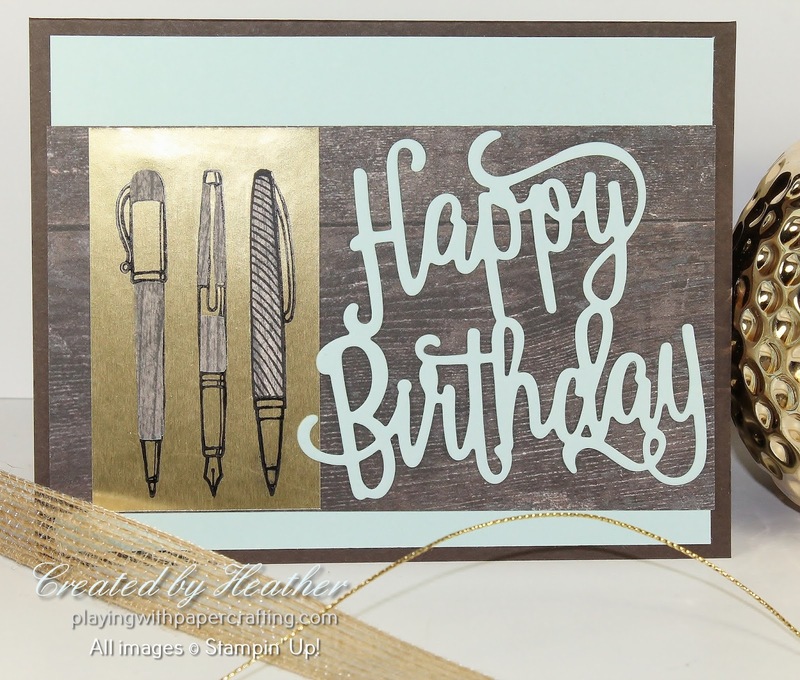 The sentiments come from the Happy Birthday Thinlit Die*, from which I trimmed the Birthday part for this card, and Guy Greetings. I had to mask the Happy from this sentiment, using a piece of tape over it when inking it up, then removing it before stamping. I die cut it with the banner from the Large Numbers Framelits. 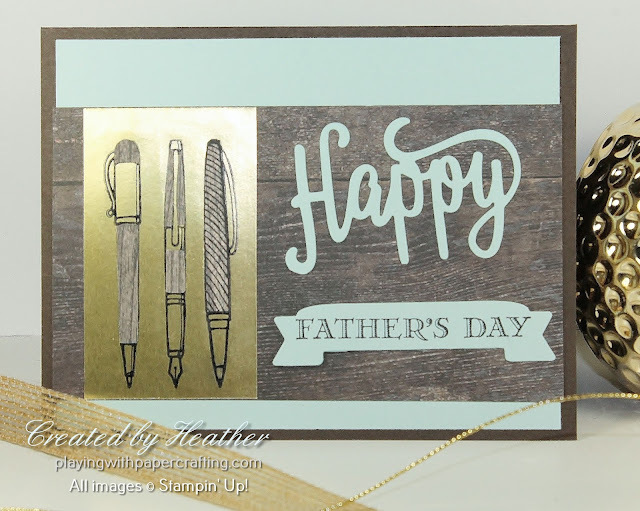 I wanted another version for those who didn't want to make a Father's Day card, so for that I just left the Birthday attached to the Happy from the Happy Birthday Thinlit Die* and glued on the whole thing! Time is running out on the retiring items from the 2016-17 Annual Catalogue and the 2017 Occasions Catalogue. You only have 2 weeks left to get what you want from these two publications. Remember, even if the stamps and dies of a bundle are not retiring, after May 31st, you will no longer be able to purchase them as a bundle and save 10%, so you might be advised to purchase them now if you want them so you can save that 10% rather than pay full price for each item separately. Make sure you get your orders in before the deadline so that you don't find yourself with no options!